Grant’s love affair with hockey began as a boy wearing a toque and bulky snowsuit, on wobbly skates with a battered hockey stick over his shoulder heading for the outdoor rink across the street from his home in Grande Prairie. Later his skills were honed on rinks at the Bear Creek Flats and the Lewis Hawkes Arena; facilities built by Legends before him. Grant played every level of hockey that Grande Prairie had to offer. He was a natural leader both on and off the ice, a coach’s dream and a crowd favorite. He was among the throng of kids who derived enormous benefits from Grande Prairie’s hockey programs as he moved through the various stages from novice to old-timer. Legends Roy Peterson and Jim Patterson coached Grant as a Bantam winning a Provincial Bantam championship. On the ice Grant was the leader. Playing junior hockey with the Grande Prairie North Stars “He was a complete player and an impact player on defense - his greatest strengths were his leadership and competitiveness.” (Lorne Radbourne – coach). During his three years (1973-76) as a junior in the Peace Caribou Junior Hockey League, Grant was recognized as a first team All-Star and the League’s most valuable defenseman in 1976. At every level Grant was a dominant All-Star player. Playing with the senior Athletics Grant was a great defenseman and “When he was in front of me I had tremendous confidence in his hockey skills and mental ability to be able to move the puck out of our defensive zone.” (Lionel Jones-goal-tender). The most significant testimonial to Grant comes from the Athletics stick boy who observed that he was generally mild mannered but “When the puck drops, watch out. Games against arch rivals, the Hythe Mustangs were especially heated but he could leave it on the ice – he never held grudges”. (Jordan Menzies - son). By the time Grant graduated from playing the game, made possible by selfless volunteers before him, Grant was ready to give back. Without missing a shift, he “stick-handled” into another phase of his hockey career – Grant the Builder and as a builder he was often a “game changer”. Following is a “shrink wrapped” version of his monumental contributions as a Builder that included coaching, managing, re-building teams, and re-designing and initiating programs. He elevated the reputation of minor hockey in Grande Prairie by taking a team to compete in the prestigious Quebec City International PeeWee Tournament. In the early 90s he teamed up with Lionel Jones to create the “Fair Play in Hockey” program that was designed to reduce or eliminate dangerous play in hockey. The initiative was picked up and promoted through Hockey Alberta and Rotary International, with Gretzky as the face of the program. He was a large part of the team that brought the Grande Prairie Storm into being and steered it into the Alberta Junior Hockey League (AJHL). It is now one of the Leagues most successful franchises. In 2003 he spearheaded a successful bid to host the Royal Bank Cup in Grande Prairie (the annual tournament that determines Canada’s best Junior hockey team). Under Grant’s leadership a feeder system was developed to attract prospects for the Storm. Grants from the Royal Bank Cup made possible a Hockey Scholarship Program for Storm players and start up funds to launch the Grande Prairie Hockey Legends program. 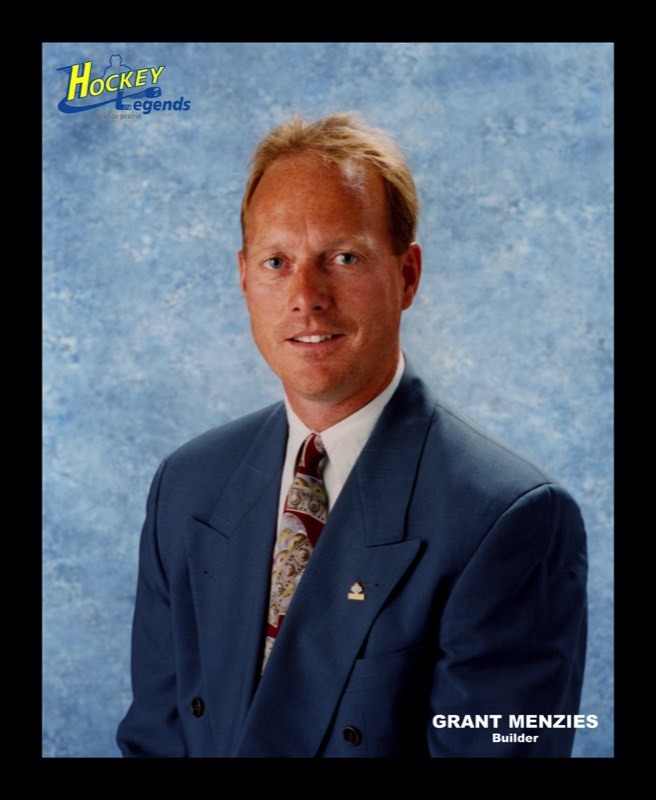 Grant Menzies - a Grande Prairie Hockey legends in 2010.